Anyone who rides knows that motorcycle expenses don’t stop after you buy your bike. Maintenance, insurance, and registration fees really add up, so for many, buying a used motorcycle can provide all the enjoyment that riding has to offer with a lower price tag. However, there’s a lot to consider when you’re buying a used bike, so here are some basic guidelines to help you make a decision. First, know what type of motorcycle you’re interested in buying—sport bike, cruiser, etc. Don’t buy a bike that’s too advanced, and don’t buy a beginner’s bike if you plan to use it for sporting purposes. If you are new to motorcycling, take a rider training course before you consider buying or riding regularly. This way, you can safely and realistically gauge your interest in getting your own bike. These classes also have valuable information on the different types of bikes available and how to find the right one that will fit your style of riding. Set a realistic budget, and take into consideration potential repairs, maintenance, tax, registration fees, and insurance. Remember that the cheapest bike isn’t always the best deal, and if it seems too good to be true, it probably is. While you might not see anything wrong with the physical bike, there’s always a reason why it’s cheap—forged title papers, fees that come with expired registration, etc. Consider motorcycles and sellers in your area first. If you buy locally, you’re more likely to know the reputation of the seller, and it’ll be easier to inspect and test ride a bike before you commit to it. If you’re going to inspect and test ride a bike, be prepared. Have a valid motorcycle license and current motorcycle insurance policy—you don’t want to get stuck if you run into any problems. If this is your first bike, bring an experienced friend who can help you make a good decision. 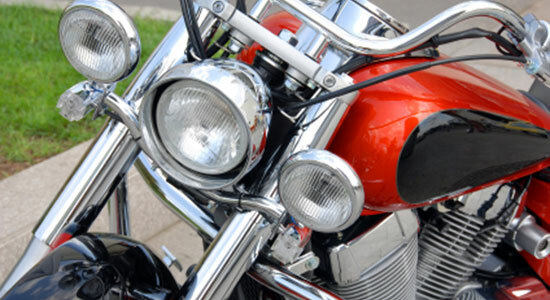 Review the motorcycle’s maintenance and repair records. A bike may run fine, but if it was in an accident, a faulty part may give you trouble down the road. Pay close attention to the bike’s title. Check the list of previous owners and transfers, and make sure the current owner’s license matches the name on the title. Confirm that the vehicle year, model, and VIN number on the title match the motorcycle. If something on the title doesn’t seem right, walk away. Ask that the seller doesn’t warm up the bike before you arrive. Starting a motorcycle cold will clue you in to any issues that may be masked by a warmed bike. It will also allow you to safely inspect parts that become too hot to handle. If you’re considering a custom bike, use extra caution. Some custom features can affect drivability and safety. Also be aware that adding certain aftermarket items may void the manufacturer’s warranty leaving you fully responsible for any and all future repairs. Consult a professional to inspect the motorcycle. If the seller is honest and legitimate, they will allow a third-party professional to take a look at it. Check the bike’s VIN number for any recalls. A motorcycle with recalled parts can be more trouble than it’s worth. For example, some Honda Goldwings were recently included in the massive Takata airbag recall. Always obtain a bill of sale so that the chain of ownership remains clear. Of course, remember to insure your motorcycle. You should carry Bodily Injury Liability Coverage (our firm recommends at least $100,000 per person and $300,000 per occurrence), which covers any injuries or death sustained in an accident, and Uninsured/Underinsured Motorist Coverage (our firm recommends at least $100,000 per person and $300,000 per occurrence), which protects you if the responsible driver cannot fully compensate you for your losses. If you can, include your motorcycle under the same insurance policy as your other vehicles and request “stacking.” This allows you to multiply your Uninsured/Underinsured Motorist Coverage by the number of vehicles on your policy, entitling you to an overall higher coverage amount. In terms of protecting your health and finances down the road, these options are relatively inexpensive. If you buy the bike in your home state, you’ll need to register it. It’s easy enough—you complete the registration process and title transfer process with your local DMV. If you buy the bike in another state, you’ll need to obtain a temporary registration from the state where you’re buying the bike as well as registration from your home state in order to ride it home. Otherwise, you’ll need to find another way of transporting the bike, like towing it. Remember, never hesitate to consult a motorcycle professional at any point—it could protect your time, money, and, most importantly, safety. Interested in staying up-to-date on more motorcycle safety information? We encourage you to join Snyder’s Riders, a community of motorcyclists committed to protecting themselves and their loved ones. It’s free, and members are eligible for prizes and great benefits. To join, visit SnydersRiders.com.